Our chess pieces are always maintenance well. We save them carefully in comfort place and clean it every day. We protect it well in order to avoid from any things that can influence its quality. We have to save it carefully. We have wood chess product in standart design to stock. We care about every pieces of our products. We eliminate the failed products, even when it has a little spot or damage. We guarantee that we only produce and deliver the best products to your hands. In the picture above is our Pawns chess pieces for stock. Those black Pawns area made from best quality of Teak wood. So it is very durable in any seasons and in any space, outdoors-indoors. 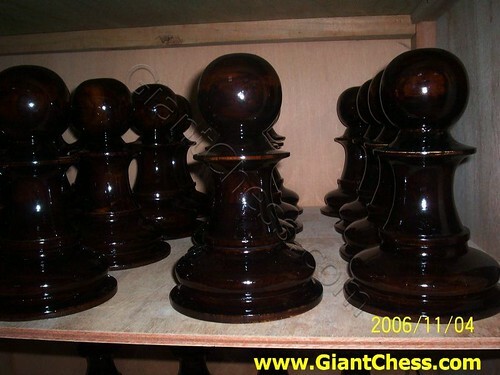 Those chess pieces are handmade product that carved by professional craftsman and polish well. We choose the best and dried Teak as the main material.